Chilling and full of suspense! How do you escape a murderous psychopath brother who suspects treachery at every turn? The narration of the audiobook by Naomi Frederick is mesmerizing! The incredible true story of a woman who risked everything to put her brother, a murderous psychopath and one of the world's most infamous crime bosses, behind bars. Astrid Holleeder is in hiding because she had the courage to write this book. Her brother Willem Holleeder, best known for his involvement in the 1983 kidnapping of the CEO and chairman of Heineken brewing company, is one of the most notorious criminals in contemporary history. For decades, Wim ruled over his family mafia-style, threatening death if any of them betrayed him. Astrid and her sister, Sonja, watched as their brother eliminated anyone who got in his way, and they lived in terror of inciting his rage, unable to protect even their own young children from his violence. Trained as a lawyer, Astrid served as her brother's unwilling confidante. Now, she's turning the tables on him. Charged for his involvement in multiple assassinations, including that of his former partner and brother-in-law, Holleeder is finally on trial for murder, all due to the shocking testimony of his own family. An international bestseller that has sold more than 500,000 copies in Holland, this stunning, edge-of-your seat memoir chronicles Astrid's terrifying experience working as a double agent, preserving her brother's trust just so that she could get enough information to put him away for life. 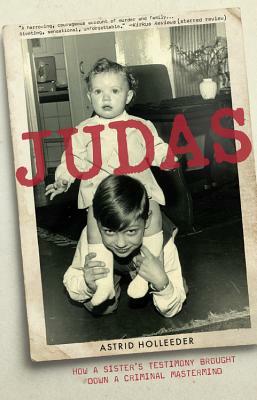 Judas is the intimate account of Astrid's deeply personal betrayal, set against the backdrop of their haunting family history and the astonishing world of the criminal underground. Astrid Holleeder is a Dutch lawyer and writer. She is the sister of the criminal Willem Holleeder and was, together with her older sister and a former friend of Willem, a witness to his prosecution. Her memoir Judas sold half a million copies and became the bestselling book in the Netherlands in 2016. Her second book, Diary of a Witness, also became an instant bestseller.